After weeks of building momentum that seemed to be leading to a reckoning between The Chi’s sordid characters, “Ease On Down The Road” is a casual finale. There aren’t any shocks or twists, nearly everything happens as one would suspect. Ronnie turns himself in. Quentin avenges Jason’s death and we finally learn the truth of how he was murdered. Of course, this truth doesn’t really change the circumstances of Jason’s death. It turns out, like Coogi, he was just in the wrong place at the wrong time. There’s no grand conspiracy, just an unlucky kid. 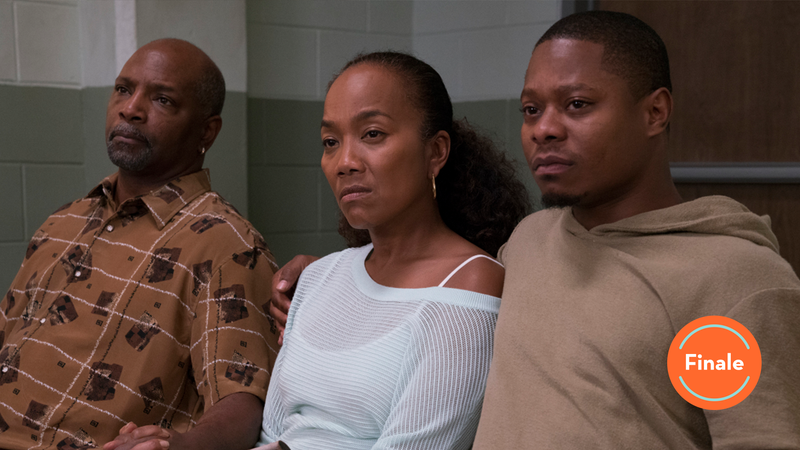 “Ease On Down The Road” cements The Chi’s status as a show that’s more interested in allowing viewers to hangout in the world it creates than dramatics. This tactic has helped the show’s characters move beyond the broadly painted stereotypes of the pilot, but it hasn’t created the most engaging plot points. It’s been great to see Emmett grow into his role as a father, but this week he just gets another lesson in how important it is for him to get custody. We’ve already covered this. It is fortunate that the show bypassed turning Emmett’s baby momma into a domestic abuse victim. It almost felt like the show was trying to force some conflict into Emmett’s storyline in the season’s final moments, but that gladly wasn’t the case. Emmett’s narrative is a case where the show’s casual hangout vibe works. If we accept The Chi as just a glimpse into Emmett’s life, it’s easier to overlook how little progress his plot made this season. There was never closure around his failed shoe plan. We never saw his partnership with the corner store come back up. Emmett doesn’t get trapped in Quentin’s web. Emmett closes this season with no real new challenges. This pace works for Emmett, but it doesn’t work for the show’s more thrilling figures. Quentin in particular is failed by this finale. We already knew Trice killed Jason, but the show gives us an unnecessary coda to make it clear that the cop Trice worked with could’ve saved Jason. This feels pointlessly cruel since the nature of Jason’s death doesn’t change the impact of his death. It does give Quentin a reason to kill off this cop, which is great for Detective Cruz. Hopefully this brings him into the central plot next season rather than leaving him isolated in some weird cop drama cover up. After building up Quentin to be the big villain this season, the season ends with him consolidating power. Reg’s interaction with his gang hints at the power struggle that could happen next season, but for now, “Ease On Down The Road” allows Reg’s new success to have some finality. The moment where Quentin reassures Tracy that everything has been handled works, but it also makes Ronnie’s plot feel pointless. Tracy and Ronnie parted ways early in the season, but Ronnie is only in his situation because of his love for Tracy and Jason. Last week’s reveal that Quentin raped Tracy was powerful, but the show failed to connect Ronnie to this experience. We never saw Ronnie have animosity or problems with Quentin. We don’t even know if Quentin knows who Ronnie is to Tracy and Jason. Over the course of the season, Ronnie’s redemption arc played beautifully. Quentin’s actions undercut that growth. There’s also something odd about Quentin giving Tracy the justice she was looking for all season. The parallel with Coogi and Lorraine shows that Tracy’s justice is empty. Sure, she’s been told everything is taken care of, but she’ll never know for sure. She’ll never build the resolve Lorraine has to see her son’s murderer go to trial. Laverne and Tracy weren’t given much to do this season, but this final divergence in their narratives feels realistic. Brandon’s storyline doesn’t feel particularly realistic this episode. Reg finally decides to cash in on the favor Brandon owes him, but other than that, it’s stagnant. Brandon feels insecure about Jerrika working with the guy she hooked up with while they were broken up, but it doesn’t go anywhere. Now that Laverne has decided not to sell the house, Brandon will most likely benefit from his agreement with Reg since he needs to pay Jerrika back. Still, Brandon has spent the past few episodes wandering between plots. He would’ve been more grounded in the show if Reg’s request had come earlier in the season. It doesn’t work as a finale twist since we already knew Reg was going to ask something of Brandon. Brandon worked best this season when his story was tied to Reg and Kevin so he’s in a great place for season two. The kids also aren’t given much to do this episode. Jake witnesses Trice’s murder and decides to fully follow in Reg’s footsteps. Kevin and Papa do the school musical and go to an afterparty. Michael Epps did an amazing job watching the play with both envy and disdain, but neither Jake nor Kevin are safe from the intrusion of adulthood. Kevin may be aligned with Papa when it comes to girls and school, but Detective Cruz’s visit to his apartment may force Kevin to grow up sooner than expected. “Ease On Down The Road” is a quiet finale for a show that’s still figuring out its pacing and overarching themes. It almost works as a series finale in that it neatly ties up the season’s biggest mysteries and conflicts. The Chi is a promising show that’s still figuring out its exact voice, but it has succeeded at creating a compelling world full of characters who are worth watching. The show has only become stronger as these characters are brought closer to each other and this finale sets us the show up for a more precise second season. I wish we could’ve checked in on Ronnie’s grandmother. Or it would’ve been nice to see Tracy react to Ronnie turning himself in. The show never really got better at telling the stories of female characters. Seriously, what did Detective Cruz even do this season? He didn’t solve a single crime. He didn’t uncover the dirty cop. I still feel like he was the biggest distraction of the season.